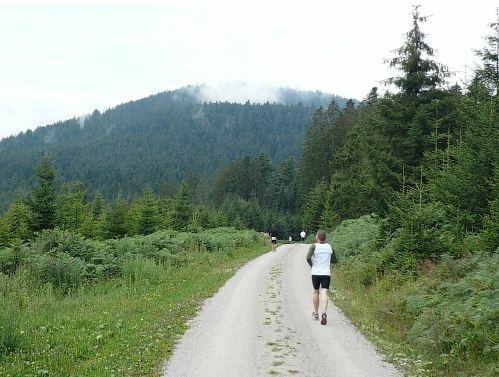 Despite my obvious lack of blogging I have been diligently running and racing, completing the Hornisgrinde Marathon in the Black Forest, this past Sunday. Due to a busy year at work and renovating at home I have reduced my weekly mileage by at least a third this season. With this in mind I was quite pleased with my 4:28:37 marathon finish on a hilly marathon course. The Hornisgrinde is one of the higher elevation points in the northern Black Forest area. The start of the marathon is in Hundseck, a ski lift and resort area. The marathon course is primarily forest, partially forest paths, but sprinkled with asphalt or concrete trails/roads throughout. The first 25 kilometers are for the most part flat or downhill, but any thoughts of an "easy" marathon course quickly evanesce as the course loops around back towards the finish line. The beautiful trails through the Black Forest are very soothing as your quads and lungs struggle over the last third of the trail. This year the very cool temperature (9°C), mixed with a little wind and light rain kept me from dabbling too long at the friendly aid stations. With short sleeves and shorts I was woefully underdressed for my plodding tempo. If I had properly trained for this event I would have taken advantage of the cool temperature and tried to run a course best time, but such was not the case. This was the fourth year that I ran the full marathon, twice before that I ran the half-marathon. The race continues to be one of my favorites, the scenic course is one of the most beautiful that I have experienced in Germany. The organization and friendly volunteers are absolute tops, the crew definetly deserves special credit this year, they froze their butts off and still had a friendly smile and kind word for the runners. This page contains a single entry by Jack published on July 26, 2011 9:19 AM. Missing in Action was the previous entry in this blog. Test: This is a new Entry is the next entry in this blog.